A visit to Bamberg, Germany's Medieval Christmas market and the main one on MaxPlatz. Includes nativity scenes from several churches and snow scenes of this wonderful German town. Join me as I get a hands-on tutorial for making Germany's famous gingerbread Christmas cookies, Lebkuchen. You can do it, too! 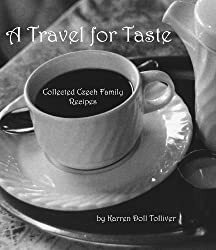 The authentic German homemade family recipe is is my book, A Travel for Taste - Germany, available by clicking the Shop tab at the top of the blog. It will be like you visited Nuremberg's Christmas market in person! Here are some photos about the grocery store offerings near July 4 -they reflect the US Independence Day in a roundabout way. At least the colors are right! Touring Munich in vintage, classic BMW convertibles from the 1930s plus a walk through the BMW Welt showroom, the BMW Museum and BMW factory in Bavaria, Germany. My first of several visits to BMW Welt in Munich, Germany. It's next to the Olympia Park where the 1972 Olympics were held and those terrorists created such a stir. It was a peaceful visit, though, and one of my longtime wishes came true! Part II of the German marching band music (Blasmusik) competition in Bischberg - plus a parade! Check out the Pentecost procession in my little village in Germany near Bamberg - Bischberg. Following that there was a competition among the regional marching (oompah) bands in which I nearly drown because it was raining so hard! Opening procession photos of Bamberg Zaubert, annual circus celebration in downtown Bamberg, Germany. Musings on life in Bavaria, open-air markets, dirndl racks in department stores, and European traditions. What it's like to experience the FIFA World Cup in Germany when Germany is in the World Cup! OMG, people, I realize I left out the best part of the apartment story! Remember (and I know you remember because you hang on my every word and commit it to memory) that the first apartment I looked at in Bamberg was a one-room studio overlooking a courtyard in a semi-industrial area. Across from the apartment was a fitness studio that was being built out and would open soon. It was this construction that made the area look not quite so beautiful when we looked at the room.